Unfinished Canton, Murkmire, Bright-Throat Village. 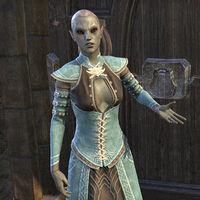 Varona Beloren is a Dunmer who can be found in one of the Unfinished Cantons in Vivec City. She is the wife of Overseer Shiralas. She can later be encountered in Mukmire on vacation. 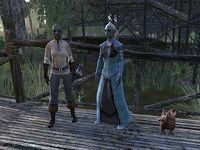 Varona owns a pet Bantam Guar named Drooler. She can first be encountered reading outside one of the Cantons, when she is spoken to she will say "(?)" Needs verifying that she appears in city before her quests. Vaguely remember she does. "My wife decides to run out and chase some damned looters in the middle of a disaster! Who does that sort of thing? You'd think Lord Vivec's Overseer would have a clearer head!" The Overseer? I need to find her for Lord Vivec! "She ran into the unfinished cantons. She's been beating herself up over the fact that they're behind schedule, but she won't do anyone any good if she gets herself killed! My wife's tough as nails, but she's no warrior." I'll find the Overseer and make sure she's all right. "If you can, please bring my wife back to me safely. I'd like us to be together when Baar Dau crashes down around us. Five years of happy marriage and this is how it all ends? I wish Lord Vivec would just do something!" "A vacation! I don't think Shiralas has taken time off since we got married! I hear Seyda Neen is beautiful this time of year. Maybe we can take a cruise up the coast..."
"Hey, you're the Champion of Vivec! I remember you! Did Drooler find you and bring you out here? He's such a good boy!" Your wife sent me to find you. She was worried when you were gone so long. "Shiralas sent you? She worries too much, but that's why I love her. We did get a little turned around. And then that creature started sniffing around. Now that you're here, I think we can make a break for it. Drooler can lead me back to Shiralas." She will then speak to her pet, saying "Come on, Drooler. Let's go find Shiralas." before heading off. "Shiralas has been much more attentive since we got back. I think she even missed Drooler, if you can believe that. I may have to get lost more often. I do so love the way she dotes upon me. Anyway, thanks again." This page was last modified on 21 November 2018, at 16:07.